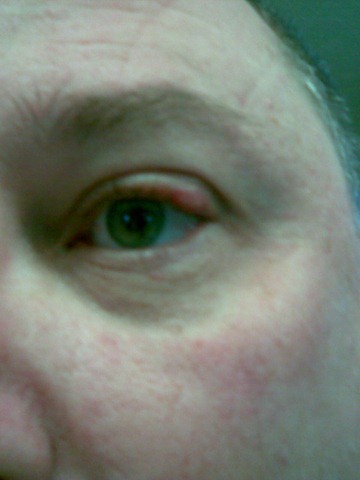 At the end of December, I had a Chalazion on my left eye again… I really hate these things. This started to get big quick and started to hang down into my line of sight. I was off work between Christmas and New Year, so I was to really get after the hot compresses on that eye and on the 3rd if finally decided to rupture out of the front side of my eyelid… but at least if feels better now and it seems to be resolving now. While it’s still there, It does not seem like it is as bad and I’m not seeing it in my vision anymore. While I understand what technically causes this… I’d really like to understand why I seem to have a propensity to get these over the last 5 years and why my left eye seems to be more likely to have a Chalazion than my right. Well today is my next appointment for my eyes…. I get to find out if I get another pass or if I my chalazion removed. I’ve had one that I’m trying to get to go away with compresses but it’s been tough and it’s only really reduced a little bit. Over the weekend we finished up getting the camper ready for the season and then had a small campfire in the back yard. 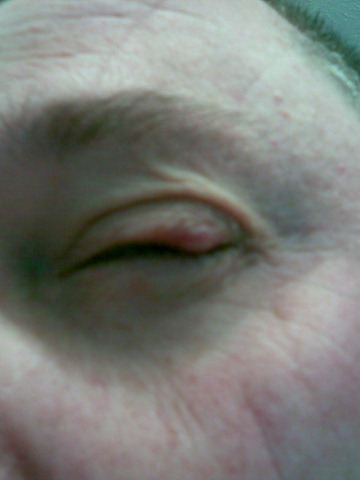 When I saw the Ophthalmologist in December, he felt that we would be doing the removal surgery today…. and I’ve been very apprehensive all day today. When he examined my Chalazion’s today he seemed to think that I’m making progress with the Chalazion in my left eye (which is reversed in the pictures below) and it was getting smaller (this is in the upper eye lid 3/4 the away across). 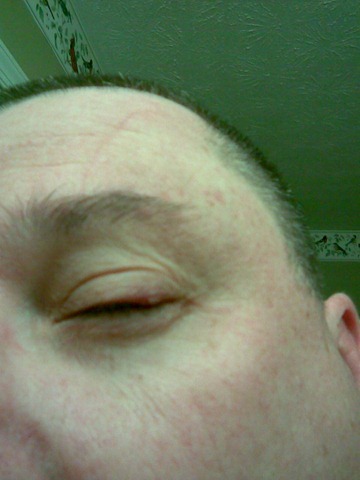 In November, it was large enough that I could see the Chalazion in my peripheral vision. However, the one in my right eye on the lower eye lid is not shrinking and had gotten slightly larger. He said that if he were going to remove one today, that would be the one he would go after. We talked about how I was doing my compresses (I always do the left eye first and then move to the right) and he suggested that If I wanted to wait a couple of months and try doing the right eye first while the compress is hotter, that he thought that would be ok. But if it was not better in March that he would recommend removing it then…. but I had the option to remove it today if I wanted too. So long story short, I decided to put it off until March to see if I could get it to shirk on its own like the other eye did. While I have to admit that this surgery is probably just not that big of a deal in the grand scheme of things. I’m just not too excited at all to go back and do the whole remove thing again if there is any way possible to avoid it! 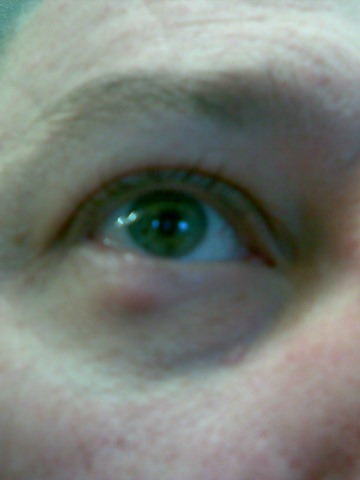 I had my return visit to the Ophthalmologist today to review my Chalazion’s. I’ve got one in each eye and when I was there for my eye exam two weeks ago the doctor prescribed oral antibiotics and an eye ointment. I’m supposed to apply my hot compresses 4 times a day, followed by the ointment in each eye, followed by my oral antibiotics. 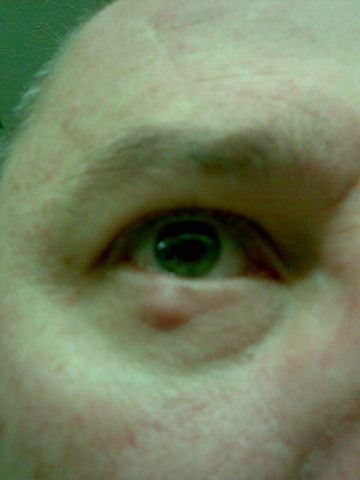 My left eye (the worse of the two) seemed to have gotten smaller and the right eye was a little larger. 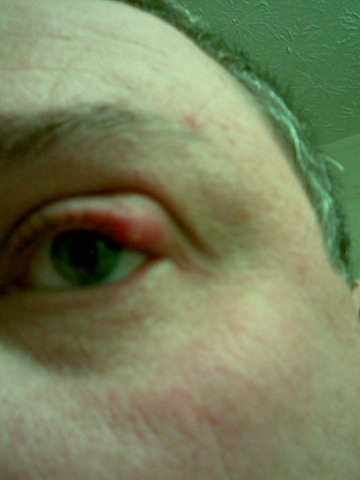 Today was a toss up in terms of having the Chalazion removed in my left eye. After the doctor looked at each eye and took the pressure reading for each eye, he gave me a choice… remove or give it another 4 weeks to try and reduce them some more. Based on my previous experience, we are going with plan B another 4 weeks. So I got refills of both prescriptions and order to continue the compresses and medication. The doctor hold out little hope that I can resolve them with the regiment, but is willing to give it a try based on the reduction in the left eye over the last two weeks. I went to the Ophthalmologist yesterday and half expected to get my large Chalazion on my left eyelid removed after my eye exam. I was pretty relived when the Doctor said he wanted to give it another two weeks. I’ve got oral antibiotics a topical ointment for my eye (to be used immediately after my hot compress) and all to be done 4 times a day. After I use the ointment, my vision is kind of blurry for about 10 – 15 min but the benefit is that my eye does not seem to feel as irritated after a treatment. So I get to go back on the 21st and if it’s not markedly better then we’ll proceed with the removal option. I had noticed that I’ve got another one starting to form in my lower eyelid (on the other eye) and after the exam the Doctor told me it was more like two – three in that lower eyelid (just wonderful)! So now I’m really doing time with both eyes on my compresses… I would really like to avoid the knife if at all possible. I read this article and thought there was some useful advice on the page and also found it (well if I can use the term “entertaining” to describe my issue) to have some humor around the condition and the unintended consequences around it. It seems like I’m now having some multiple re-occurrences of my Chalazion’s. My left eye has one in the upper eye lid at the outside corner of the eye and my right right eye has one on the inside corner of the upper eye lid and one in the center of the lower eye lid. For the past couple of days they have been driving me crazy. It’s not that they are overly painful, just the fact that they are there and I can feel them is enough. I’ve spend the day putting hot compresses on my eyes in hopes that it will move along and allow them to resolve. The one in my left eye is going on a month now and getting larger so I’m thinking that I’m going to need to see the ophthalmologist about that one as it is.